Three planes from Kelly Field, flying in triangular formation, made the journey to Green Lake, Texas yesterday and returned – a distance of 130 miles – without ever breaking formation or being at a greater distance than 25 feet apart. This is considered a remarkable record in formation flying. The Bexar County commissioners wiped a town out of existence this morning. This was the town of Viva, about 18 miles north of San Antonio on the Kerrville branch of the S.A.A.P. railroad. Workers spend five hours removing the 4,000-pound marquee from the Texas Theater (right) only to have it bend and crumble due to structural rust. 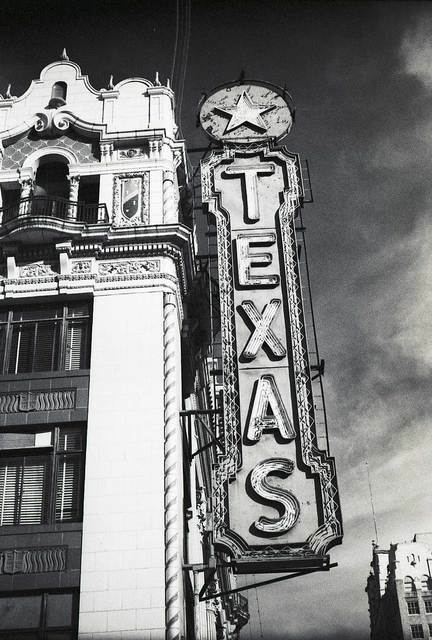 The marquee was due to have been donated to the Institute of Texan Cultures. Posted on August 14, 2018, in Texana and tagged 1918, 1922, 1982, WWI. Bookmark the permalink. Leave a comment.